I reached out to Doug Davison of Fantasy Grounds developer SmiteWorks. He was predictably mum and couldn’t discuss the specifics of the license, but he was happy to discuss both the history and future of Fantasy Grounds. He also offered me reviewer access to the D&D 5E content, so I do have some first-hand knowledge from poking around the product, though I have yet to actually run a game utilizing it. Virtual tabletop app sales are mostly a zero-sum game, so a win for Fantasy Grounds means a loss for Roll20, by far the largest player in the space. I’ve previously estimated their current user count at 875,000, and they’ve confirmed a whopping 1,300 new users per day. From a profit maximization standpoint, Roll20 seems to be the natural partner for Wizards of the Coast, since D&D 5E is now a full 25% of games played on the platform. I spoke with Roll20’s Nolan T. Jones about the announcement, and while he couldn’t even confirm if he has ever talked with Wizards over licensed D&D 5E content, he was willing to shed some light on his general experience with licensing and what it what licensing means for Roll20 going forward. Given what we know (and think we know) about Fantasy Grounds, Roll20, and DungeonScape, let’s get on with some old-fashioned reckless predictions, shall we? While Davison couldn’t comment directly, Jones was very clear that Roll20 has “yet to have had a licensing deal fall apart due to exclusivity requests, price points, or percentages” but did note that “several publishers have refused to talk to us outright.” Since I can’t imagine Wizards would ignore the largest player in the game in Roll20, and since neither Wizards nor Fantasy Grounds’ official announcement claims exclusivity, this suggests the door is still open for D&D 5E content on other platforms. Davison says he has noticed “ongoing demand for an officially supported virtual tabletop, as well as for character builders and tablet and phone apps for use around the table,” and that Fantasy Grounds doesn’t aim to be the “one solution to fill all these gaps.” This suggests there are more licensed apps coming. Reckless Prediction II: Fantasy Grounds is Going to Grow. Fast. Like many observers, I was surprised to see the digital versions of 5E content priced the same as the MSRP of the print versions. I’m skeptical that players will be willing to buy very similar content twice, especially at those prices. But we’re talking about Dungeons & Dragons: it’s a behemoth of a brand coming off a very successful 5E launch with a well-funded marketing engine and public shareholders to report to. 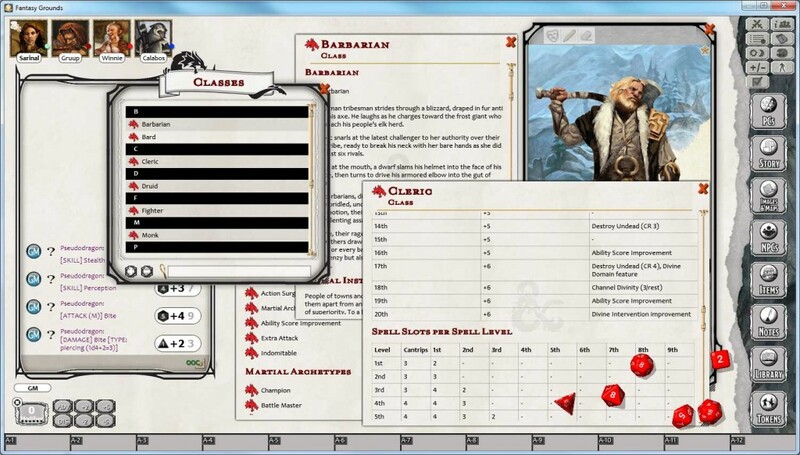 D&D is the type of game that will drive players to Fantasy Grounds to buy their content. They haven’t released usage stats, but Fantasy Grounds’ user count is certainly a fraction of Roll20’s; that leaves an awful lot of runway for growth. To put it another way: Fantasy Grounds just made a lot of noise while claiming a seat at the table. They might not reach Roll20’s size, but by adding D&D 5E to existing Savage Worlds and FATE licensed content, they aren’t easy to ignore any longer. If publisher resource constraints are a challenge even for the largest virtual tabletop developer in the business, then given their history, I doubt Wizards of the Coast is an exception to the rule. I suspect Wizards will continue its plodding pace for releasing future content, and I doubt it’s in a hurry to explore additional virtual tabletop platforms. 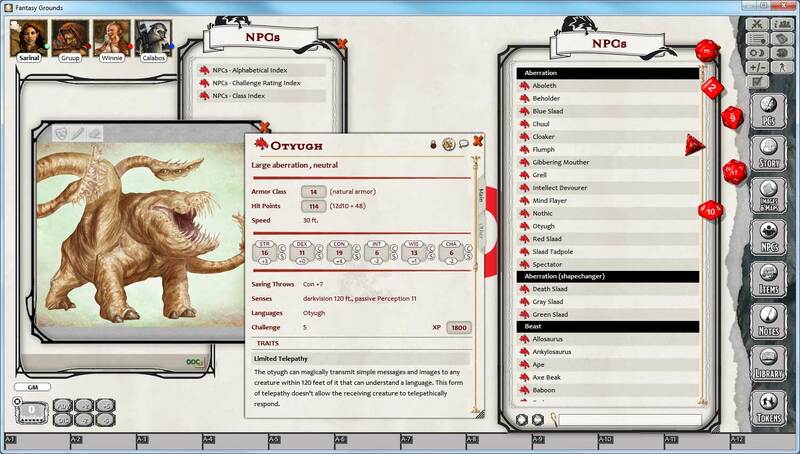 Given the amount of effort needed to build this content, the fact that Fantasy Grounds handles so much of the conversion work likely made them a very attractive initial partner, even with a smaller user base. If Roll20’s connected-in-person approach sounds vaguely familiar, that’s because it was the central design principle for DungeonScape, and it’s something Fantasy Grounds really isn’t offering. Davison acknowledged that the Fantasy Grounds team has “talked a lot about expanding out to cover connected face-to-face games” but that they “really view Fantasy Grounds as a way to play the game fully online.” He also notes that, as a GM, he prefers to use Fantasy Grounds to run his games alongside physical character sheets, map, and miniatures, but acknowledges this approach “only uses about a quarter of [Fantasy Grounds’] capabilities,” so the players don’t need to be connected to benefit from virtual tabletop platforms at a physical table. A few years down the road, I expect to be looking at a two-horse race, where Roll20 is a nearly ubiquitous presence at actual tables, rather than just virtual ones, and Fantasy Grounds settles into a premium niche with high quality, high-priced content from the largest publishers in a strictly virtual tabletop format. Looking out at the landscape, it’s tough to imagine any of their competitors gaining any ground at this point. This statement might be approaching axiomatic at this point, but nothing about Wizards of the Coast’s agreement with Fantasy Grounds really changes the perception that Wizards just doesn’t get digital. From the 4E days of D&D Insider (which, to this day, lacks a fully-functioning character builder) to the D&D Next playtest days of DungeonScape, to the current 5E content deal with Fantasy Grounds, Wizards still seems to be throwing stuff at the wall to see what sticks. Even if the deal proves to be a smashing success for both parties, it will seem to some observers, including this columnist, more like a blind squirrel finding a nut than a well-executed strategy. And either way, critics will point to the elephant in the room, which Wizards of the Coast seems hellbent on ignoring: simple, bookmarked and hyperlinked PDFs. With the luxury of distance from the decision-making process and a dose of hindsight, it might be easy to blame Wizards’ digital fumbles on misguided concerns of piracy or common ineptitude. I don’t think you can say the same of the virtual tabletop developers, though. They’re looking at the marketplace from different points of view and taking different approaches, but both Roll20 and Fantasy Grounds are smarter than we sometimes give them credit for. After all, they’ve grown the virtual tabletop market from nothing in the early 2000s to a major venue for players in a little over a decade. Major. As in, even Wizards of the Coast had to take notice. In defense of the publishers, I think many of them have seen poor returns on previous virtual tabletop endeavors and [Roll20 has] very little accurate rules-specific content we sell to show trends in that area. What we-as-Roll20 have to make clear going forward is that we are now larger than every other virtual tabletop historically combined– so we assume our basement for sales is better than anyone else’s top floor. I’ve been playing D&D since I was a child and, since I took ownership of SmiteWorks in 2009, I’ve desperately wanted to do an official ruleset and content for D&D within Fantasy Grounds. Over the years, we’ve managed to negotiate deals with a couple dozen different game publishers to bring their content directly to fans of Fantasy Grounds and to provide an online interface for the fans of each of those RPG systems. D&D was the elusive fish we just couldn’t catch – until now. Given the success of their respective platforms, maybe Wizards should just listen to these guys. This entry was posted in Dungeons & Dragons, News, Thinkpieces and tagged 5E, d&d, dnd, Dungeons and Dragons, Fantasy Grounds, FATE, Roll20, Savage Worlds, Virtual Tabletop. Bookmark the permalink.